Apart from the aesthetics, a home's sustainability is even more important. Who wouldn’t love a home that has features that would compliment nature? Of course, we would give that an applause. How about one that has a lovely interior and unique exterior? Or maybe a home that has many sustainability features? No doubt, we would love that too. And if we put all that together in one home, we would be blown away especially if that is actually your home. But for now, let us be inspired by this stunning impressive residence in Italy that has many features you will no doubt love. The single-family residence is called Villa N with a 210 square meter area situated in the hills of Liguria, Italy overlooking the Gulf of Imperia. 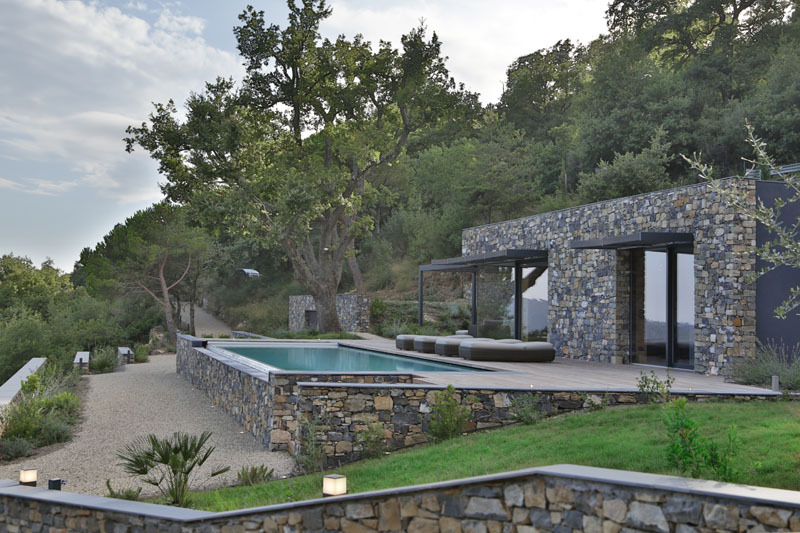 The villa has natural stone facades that play with the cultural landscape of the Ligurian terraces becoming part of it. It has large openings while facing the valley and the sea. It is also comprised of two half subterranean volumes arranged on a single floor, following the morphology of the ground and creating a noble central entrance which leads one side to the large open space living with dining area and kitchen and to the five bedrooms which all benefit from a private outside space and views over the sea. 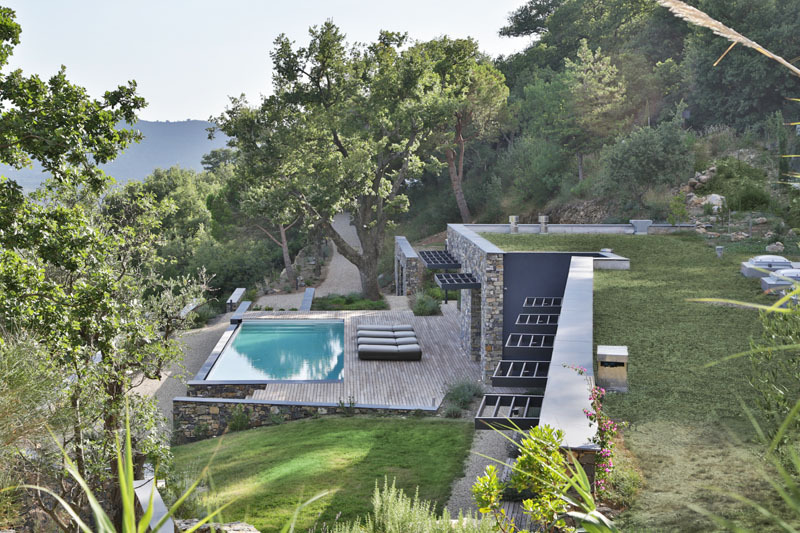 The villa has a sun deck that is situated in front of the living room which opens up to the 4x14m infinity swimming pool overlooking the valley. Large openable skylights naturally illuminate the corridor and service areas. Also found in the villa are a pantry, laundry, storage rooms, technical service rooms and external storage in the garage with two parking spaces. Unique feature: A beautiful home with many sustainability features from a stone wall to a green roof. The building, its interior and external surrounding has significant containment walls that create continuity in it. The garden patio and the sun shading canopies of the home create an mediating filter between inside and outside of the home. The house has a green roof that contributes to the harmonic insertion into the landscape and it also minimizes the visual impact of the building. 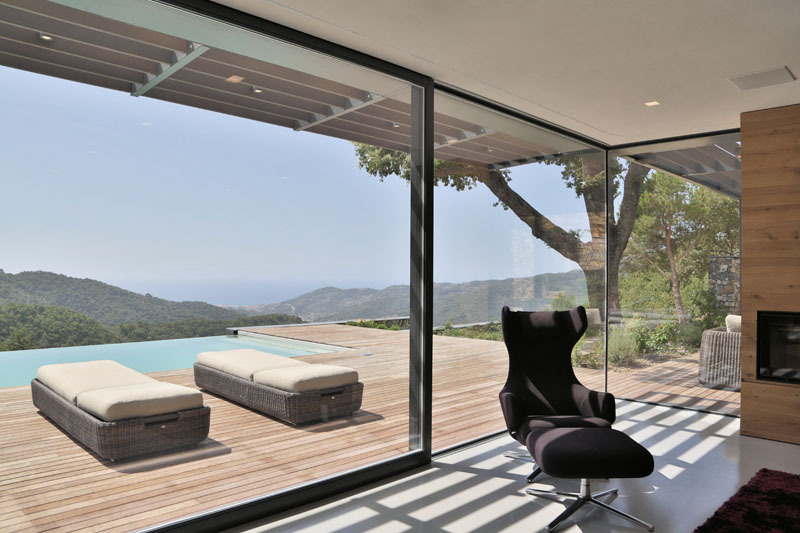 The villa features a sun deck located in front of the living room that overlooks the valley. 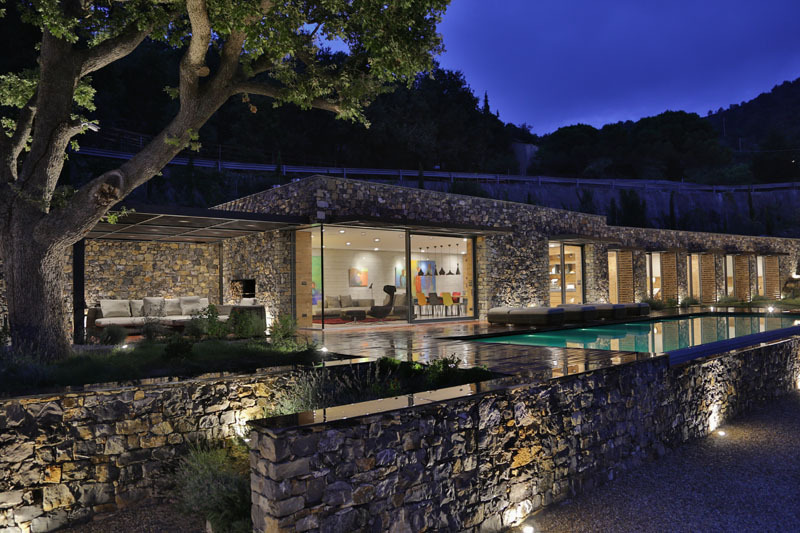 During the night, the garden and pool deck are lit up which highlights its use of stone and makes the pool area appear more dramatic. 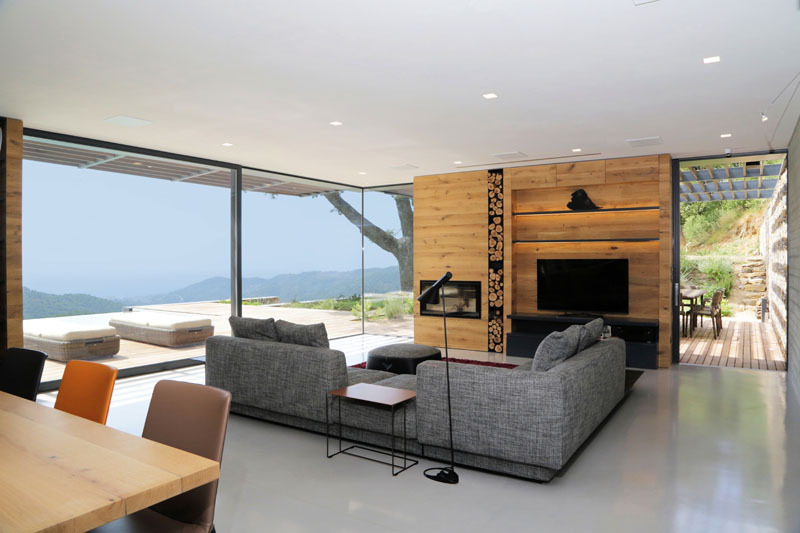 In order to increase the natural environment, the house is surrounded with Mediterranean essences while the permeability of the terrain is being maximized through the use of a combination of gravel and timber surfaces. The infinity edge swimming pool, which is one highlight of the house, is located just off the main living room surrounded with wooden deck. 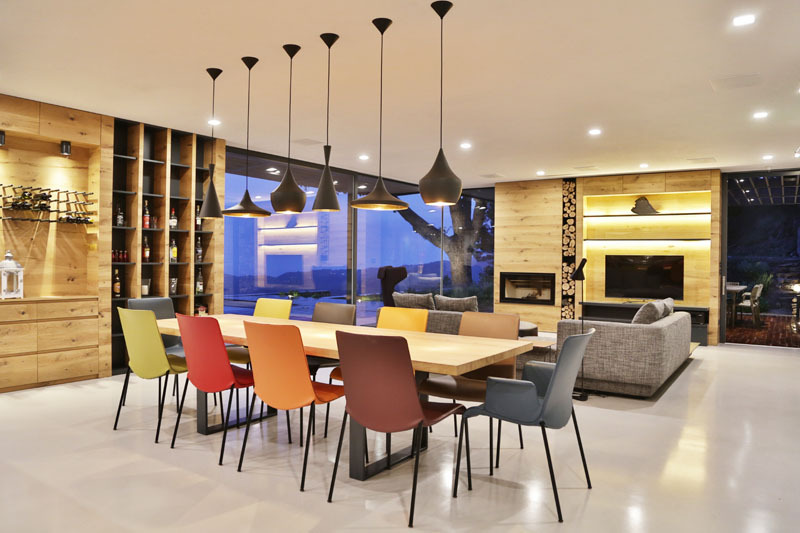 The large living room of the home is composed by the kitchen, the bar and library and the fireplace and TV, which also becomes a pure volume as a floating stand alone item with frames that are completely embedded in the timber. 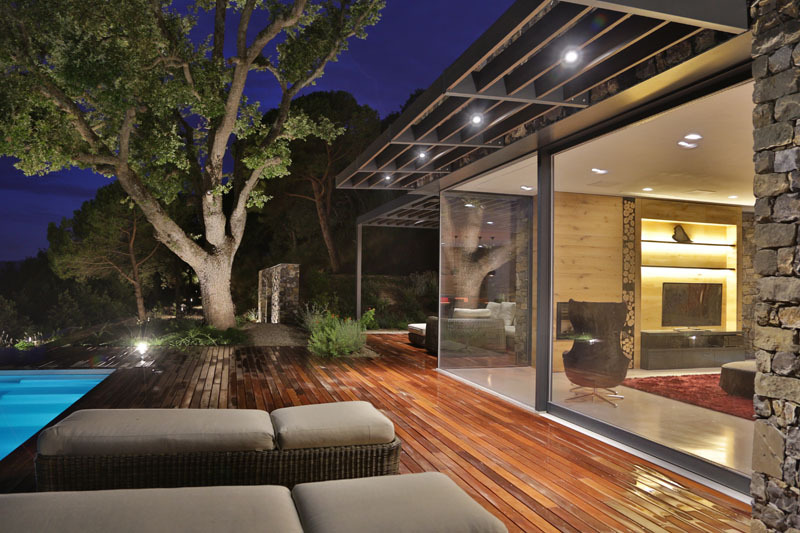 With large glass doors, it allows the home owners an indoor/outdoor lifestyle. The windows used in this house play a key role in the project maximizing views and light. 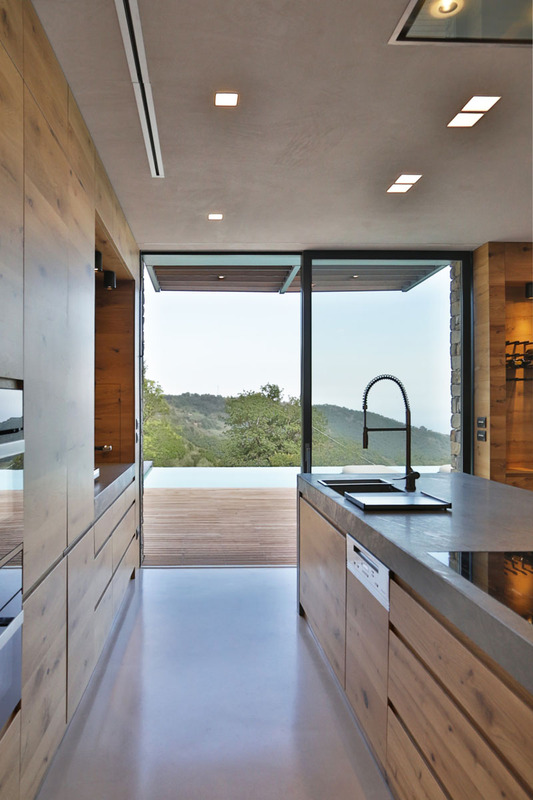 The large openings from floor to ceiling are designed to create an effect of continuity between inside and outside. The home also features a large 10 seater dining table to make sure there is enough room for everyone. I love how it used chairs of different colors in here. 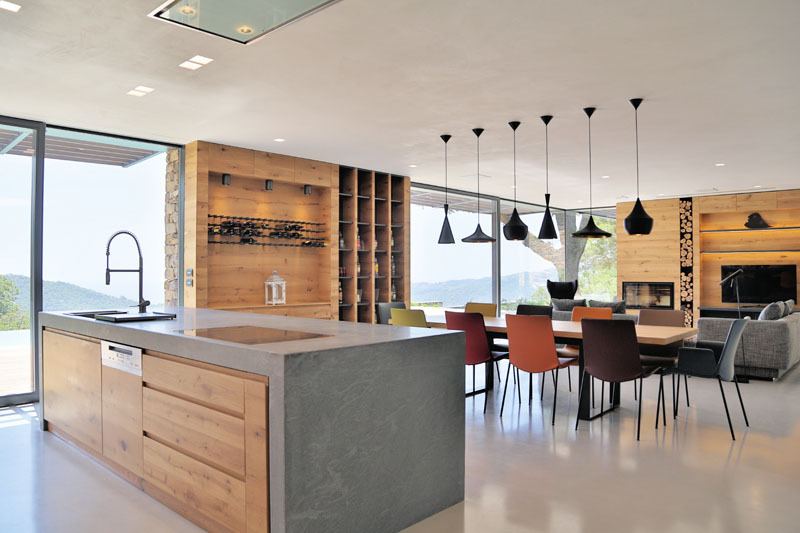 The kitchen has a concrete-topped island with wooden cabinets under it. 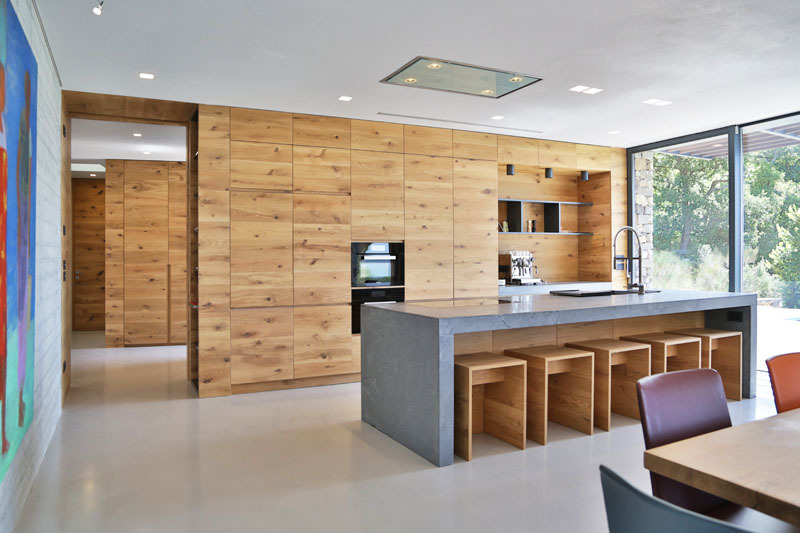 A wall of wood cabinets provide the storage in the kitchen. I also like it that some wooden chairs can be inserted under the kitchen island. From the kitchen, one can access the pool area through a sliding glass door. 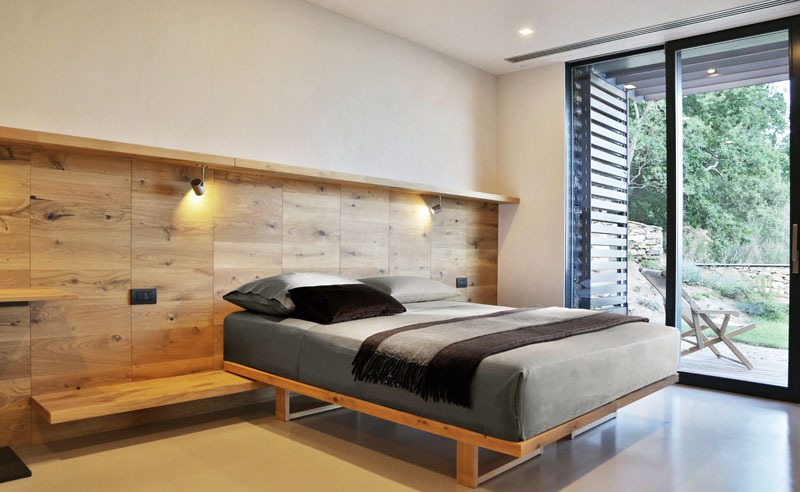 The bedrooms in this villa show a very efficient layout with built-in wardrobes and multifunctional use. It has two single timber futon beds that are positioned along a continuous oak back board floating over a low bedside rack allowing for different fit out arrangements. The same wood is also used in the bedroom for the headboard. 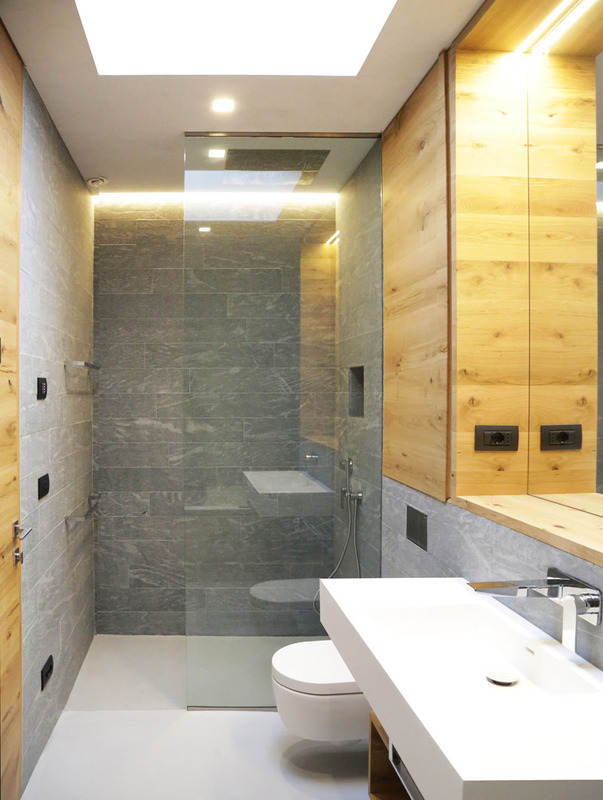 The bathrooms are clad with natural stone and fit out with oak furniture and corian sanitary ware. It is illuminated by the above skylights to create a sensational atmosphere. During the night, the stone walls of the walk-in rain shower and the whirlpool bath are illuminated by integrated wall washer lighting from the ceiling. This house designed by Giordano Hadamik Architects has many sustainability features since it is highly insulated to eliminate thermal bridges, and its ground has thermal mass to decrease heat losses. It also features a green roof to decrease the thermal disparity, maximized permeability of terrain, renewable energy sources with solar panels and photovoltaic. You can also notice that it has many windows and skylights to maximize natural light and it also used windows with high thermal performance. It makes use of solar panels for under floor heating in combination of integrated heat pump for high efficiency. It also has mechanical ventilation to maintain an optimum indoor air quality by reducing energy consumption. Yes, this is not just an ordinary home because it is also eco-friendly and very cozy too!